Ever since switching to Google Music and The Google Music app for the Android, I have yet to touch the Music Player Application on the Android. By reaching the 2,000+ uploaded songs treshold, I soon realized that this music software also suffers the same crtical flaw as iTunes: they can only organize the songs by Tag ID, typically using the Album/Artist/Genre Tags. Why is this such a big deal? Well, if you own a large song collection, you probably realized that not all mp3s and other song formats have Tag IDs imprinted in them when you downloaded/rip the song onto your computer. Thus, when the songs are uploaded into a music software, all you have for organization is a HUGE list of file, making it a very diffcult to navigate through the songs just to find the one you want to listen to. Changing the Tag ID of each songs one by one can be such a tedious task. So my solution? Since I have songs organized in folders on my PC by either date of purchase or by album name, all I had to do was use the folder name as a tag. 4) Click on the Preview. Here you can see the tags of the songs that is selected before and after filename change. 5) Type a format into the File Name Mask using the Rename Variable Guideline. 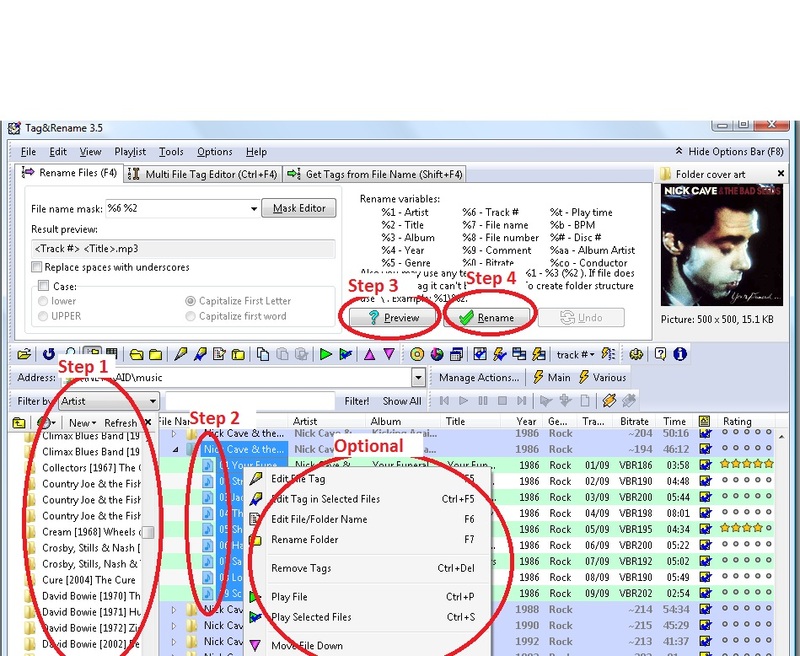 Optional: After selecting the songs, press (Ctrl+F5) to set the Tags manually. This method also changes all the tags at once using the keyword you select. It does not give the dynamic tags as the above but it works. Why? 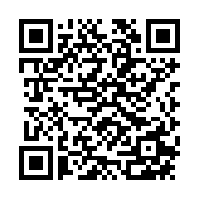 This is useful for songs that have no title or just use numbers(1.mp3, 2.mp3, 3.mp3, etc.). This commonly occurs because the song is ripped from a CD or DVD and is placed into a folder. The file cannot be renamed if it does not contain tag. 3) Click on the Preview. Here you can see the filename of the song before and after filename change. 4) Type a format into the File Name Mask using the Rename Variable guideline and click Write Tags. 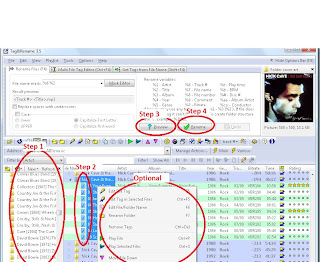 Optional: Right click on a selected song and press Edit File/Folder Name to edit each song one by one.